Map 11 Glacial geology, St Fort–Leuchars. Purpose To examine the fluvioglacial deposits of the Wormit Gap. These include the following: an esker, 4 km long; other gravel ridges and mounds; kettle holes; three large gravel plateaus with surfaces at 33 to 40 m OD; gravels and sands, probably reworked by the late-glacial sea and, associated with these, a series of late-glacial and postglacial raised beaches. They are exposed in an area 6.4 km long by 4 km wide extending south-east from Wormit to Leuchars, and are related to the retreat stages of the Late Devensian ice sheet. A Carboniferous tholeiite dyke is exposed at Newton Farm (Location 1). Route By bus from St Andrews along A91 across postglacial raised beaches past Easter Kincaple to Guardbridge. Then by A919 through Leuchars, past St Michael's cross-roads to the fork at 438233; continue on the unclassified road to the roundabout on A914. Follow A914 south-west for 1 km before turning right and following B946 to Newton Farm, 1 km on the left. From the farm follow the track uphill. One hundred metres from the first gate, at the farm yard, are weathered exposures of the local, Devonian, andesite lavas. Continue up the track to the third gate, some 600 m from the farm yard. On the left is a 4 m high cliff of columnar-jointed tholeiite in an E–W late-Carboniferous dyke. This dyke is better exposed in an old quarry further east and reached by contouring round the hill. There the dyke is 27 m thick and the chilled northern margin can be examined at the east end of the quarry. The tholeiite is vesicular, fine- to medium-grained, mid grey in colour and very fresh. It displays horizontal columnar jointing. The country rock comprises feldsparphyric, purple-weathering 'andesite' and it is part of a flow within the thick Ochil Volcanic Group of Lower Devonian age, here dipping south-east at about 20°. These flows lie on the south-eastern limb of the Sidlaw Anticline. The north-western limb of the anticline can be seen across the Tay Estuary in the Sidlaw Hills beyond the Carse of Gowrie where similar lavas and interbedded sediments dip at 20° NW. Note also Dundee Law, a volcanic plug of augite-porphyrite with its later development as a crag and tail, the tail to the east, comprising sediments which have been protected from the eastward moving ice by the porphyrite plug during the Devensian glaciation. Contrast the steep scarp slopes in the volcanics on Newton Hill with the gentle dip slopes, under cultivation, on Wormit Hill on the other side of the Wormit Gap. Either the quarry or the road below afford a good view of the fluvioglacial landforms of the Wormit Gap. Despite their steady disappearance as the fluvioglacial deposits are exploited for sand and gravel it is still possible to see good examples of kettle holes and the intervening steep-sided gravel ridges. At the St Fort Gravel Pit, clearly seen below, a borehole sunk in 1934 (Davidson, 1935) starting at 24 m OD penetrated 40 m of sand and gravel before entering andesites at 16 m below OD. Thus the Wormit Gap with its thick fluvioglacial sequence overlies a deep channel presumably cut by ice during the Late Devensian glaciation, and analogous to the much deeper channel in the Tay going down to –68 m OD below the road bridge. This area passes south-east in Links Wood into one of elongated gravel ridges analogous to eskers. Descend from the quarry, travel under the railway and turn east to enter the St Fort Gravel Pit where extraction of both sand and gravel from the gravel ridges takes place. Sand and gravel are interbedded in approximately equal proportions, but vary from 25 to 75 per cent of either at any time. The sands, usually reddish in colour, include darker beds seldom more than 5 cm thick, dominated by igneous, mainly lava, fragments. Grain size ranges from fine to very coarse sand and sorting is usually poor. Cross bedding and ripple marks are widespread. Small scale faults occur and slumping too. Dips are up to about 20° and have been described by Rice (1961) as at right angles to the length of the ridges. The gravels which are very poorly sorted range up to lm in clast size in beds seldom more than a few metres thick. In places the gravels are clearly channel deposits. The clasts comprise: (1) metamorphic rocks including mica schists, quartzites, metamorphosed grits, vein quartz and epidiorite; (2) igneous rocks, predominantly andesites, usually feldsparphyric and vesicular, the vesicles often with chlorite or agate filling, agglomerates, tuffs and volcanic conglomerates; less common are diorite, porphyry and felsites; granite is rare; (3) sediments, almost entirely sandstones which are usually red, sometimes with pebbles or mud flakes. Conglomerates also occur. The volcanics and the red sandstones point clearly to a source area dominated by Devonian Old Red Sandstone rocks while the metamorphics are undoubtedly derived from the Scottish Highlands. Of major interest is the diorite, strongly suggestive of the Comrie Diorite 65 km to the west. Much of the ice coming down the Tay and the Carse of Gowrie must have come from Strathearn to the west. Of note is the extreme rarity of rock types attributable to the Carboniferous. On leaving the gravel pit turn north on B946 towards Wormit before turning east after 280 m onto the unclassified road leading to the roundabout in Links Wood. Observe on both sides of the road kettle holes with steep-sided gravel ridges between them. Drainage is by downward percolation into the underlying sand and gravel and few of the kettle holes are wet. This topography continues to the roundabout. There turn south-west onto A914 and after 500 m turn south-east onto the broad road which leads past the buried fuel tanks to North Straiton Pit. Before going downhill from the main road to the North Straiton Pit observe the conspicuous flat-topped hill 0.5 km to the south. The top of this plateau falls gently and evenly from 40 m OD at its western end to 33 m OD at its eastern end, a distance of about 1 km. On all sides it slopes down steeply at about 20° from the almost flat top. Park before reaching the Motray Water and walk under the railway bridge to reach the pit beyond. The face is between 15 and 20 m high. In the lowest workings very well bedded fine and very fine sand and, in thin beds, silt occur. Cross bedding is usually low-angle; ripples, including climbing ripples, are present and sometimes evidence of slump scars 1–2 m deep are present. Lamination akin to varves has also been observed. Folds with 1–2 m amplitude are sometimes exposed. The major part of the face displays cross bedding in units between 5 and 10 metres high; climbing ripples are common and thin beds with pebbles up to 10 cm in diameter become commoner upwards. The topmost 1–2 m of the face are pebbly and show distinct shallow channels. Cross bedding direction measurements over a number of localities in the topmost gravels round the plateau indicate currents flowing to the east and south-east. There can be little doubt that these sediments have accumulated in a water-filled ice-bound crevasse, initially as fine sand and silt deposited under quiet 'glacio-lacustrine' conditions. As this body of water shallowed by silting up coarser material accumulated and both pebble beds and often large scale cross bedding formed. The climbing ripples point to periodic rapid influx of sediments. The pebbly final phase suggests streams crossing a very shallow body of water not dissimilar to a braided stream environment, but still ice bounded. Armstrong et al. (1985, pp. 75–8) have identified a central linear zone within the coarse esker gravels which pass from the St Fort Gravel Pit through Links Wood and on to the St Michael's Gravel Pit. The Links Wood site though largely worked out can be reached by walking from the machinery site at North Straiton Pit north-east for 0.5 km to the workings in what was formerly part of Links Wood. The sediments are similar to those in the St Fort Gravel Pit but are even coarser grained with boulders up to 1.5 m diameter and less than 30 per cent sand. The boulders are of subangular and subrounded blocks, predominantly of Devonian volcanics and sediments, but still with metamorphic clasts, particularly of epidiorite. Return to the bus and drive back to the main A914, crossing the Motray Water flood plain before turning north-east for 500 m and at the roundabout turn south-east to St Michael's (21 m). This stretch of road is quite flat and crosses what are now interpreted as late-glacial, marine, reworked sediments. These were formerly well exposed in a now filled-in sand pit at Brackmont Mill near St Michael's Inn [NO 438 224], where they displayed very abundant Corophium burrows and occasionally Monocraterion burrows (Buller and McManus, 1972). They are widely distributed at 24–27 m OD between Leuchars and Tay-port (Arbroath sheet 49, drift edition and Armstrong et al. 1985, p. 77). These sediments were deposited as the sea encroached on the steadily downwasting ice mass. In the St Michael's Gravel Pit the 'central linear zone' gravels have been extensively worked where they formed a very clear esker ridge. Most of this has now been removed but that which remains forms a ridge 10 m high consisting almost entirely of boulders of Devonian volcanics, volcaniclastics and sediments plus some metamorphics and up to 1 m in diameter – less coarse than those at Links Wood (Location 5). Level with this locality, but on the north-eastern side of the railway, is a pit in sands believed to be contemporary with the gravels to judge from their elevation. Ten metres of fine-to very fine-grained sometimes silty sands occur in crossbedded units up to 1 m thick. The topmost 2 m display pebble beds with clasts up to 25 cm diameter. These are locally erosive into the sands beneath. The remaining features of particular note in the area are the Gallowhill Plateau, on which the St Michael's Golf Course lies, and the Cowbakie Hill Plateau (see route map). These are closely analogous to the North Straiton Plateau (Location 4). Note that the Gallowhill Plateau descends to 27 m at its southern end at Leuchars. Lastly one should note the major series of raised beaches extending eastward from St Michael's Inn to the coast and one in particular at Leuchars Lodge [NO 445 225] (Chisholm, 1966) in which a kettle hole was still occupied by ice until after this beach, at 17 m OD, had been abandoned by the sea. 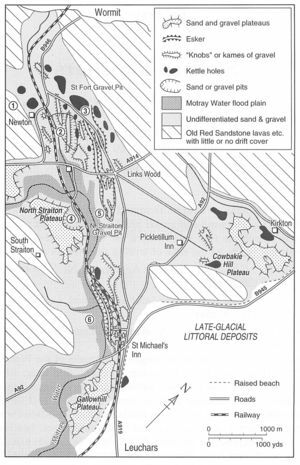 The interpretation of this complex set of late-glacial and post-glacial sediments has been set out with clarity in Armstrong et al. (1985, pp. 75–8). It is therefore only briefly summarised below. The sediments have been brought by ice to the vicinity by the Late Devensian ice which lasted from 27,000–14,000 BP. As melting became greater than advance of ice from the west the ice became slow moving or stationary, thus these deposits show no evidence of over-riding or deformation by ice and the original glacially transported sediments were reworked by melt water. Oldest are the 'central linear zone' gravels and sand ridges and eskers deposited subglacially, possibly under considerable hydrostatic pressure, by often swiftly flowing water. As this ice continued to melt gaps or crevasses of considerable size developed in the ice, only to be filled with sediment, and the flat-topped plateaus are the products of this period. The height of these was most probably controlled by an englacial water table itself in turn probably controlled by sea level off shore to the east (see the Quaternary chapter for a regional picture). Downwasting of the ice continued and parts of the area became ice free. Falling sea level at the same time prevented the destruction of most of the fluvioglacial landforms, but examples of the reworking of the fluvioglacial features are to be seen in the St Michael's area in particular and were formerly spectacularly displayed at Brackmont Mill. The southern end of the Gallowhill Plateau appears to have been eroded before sea level fell further and the last clear evidence of ice/marine water interplay is at the Leuchars Lodge kettle hole by which time sea level had fallen below 17 m OD. Return from St Michael's Gravel Pit by retracing the outward route noticing the steep northern end of the Gallowhill Plateau analogous to the steep margins of the North Straiton Plateau (Location 4). Notice too the Leuchars Lodge kettle hole [NO 445 225] on the east side of the A919 road en route back to Leuchars and St Andrews. ARMSTRONG M., PATERSON, I. B. and BROWN, M. A. E., 1985. Geology of the Perth and Dundee district. Mem. Br. Geol. Surv. Sheets 48W, 48E, 49. BULLER, A. and McMANUS, J., 1972. Corophium burrows as environmental indicators of Quaternary estuarine sediments of Tayside. Scott. Jour. Geol., 8, 145–50. CHISHOLM, J. I., 1966. An association of raised beaches with glacial deposits near Leuchars, Fife. Bull. Geol. Surv. Gt. Br. 24, 163–74. DAVIDSON, C. F. 1935. A boring at St Fort, Fifeshire. Trans. Proc. Perth. Soc. Nat. Sci. 9, 167–9. RICE, R. J. 1961. The glacial deposits at St Fort in north-east Fife: a re-examination. Trans. Edinb. Geol. Soc. 18, 113–23. This page was last modified on 23 February 2019, at 09:42.